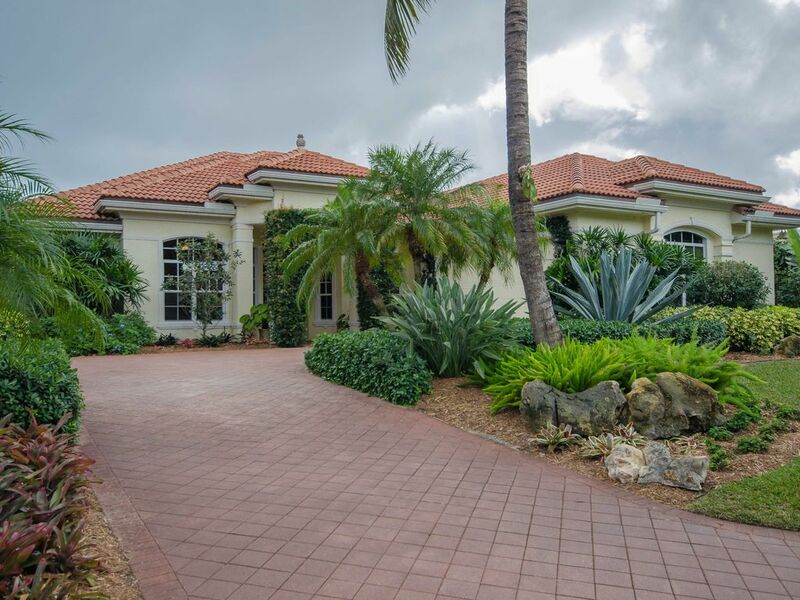 This well appointed home on Singer Island lies 600 yards from a gorgeous Atlantic beach, and 40 yards from the tranquil Lake Worth lagoon. A 15-minute bike ride brings you to the trails of MacArthur State Park--Palm Beach County's only nature and wildlife park. The park and lagoon are alive with pelicans, egrets, hawks and wading birds as well as manatee and every sort of aquatic life. Nearby Ocean Reef park offers a beach with manned lifeguard stations, picnic facilities, and (in spring and summer) turtle nesting areas. This three-bedroom, three and a half bath house is newly decorated with custom furniture and designer fabrics. The master bedroom is spacious, with walk-in closet and luxurious bathroom with separate shower enclosure and large jacuzzi tub. A second bedroom features a queen bed, walk-in closet, flat-screen television, and ensuite bathroom. The third bedroom has twin extra-long beds and adjoining bathroom. Each bedroom, the family room and separate office has a ceiling fan even though the house has central heat and air conditioninng. The living spaces are generously sized with high ceilings and glass walls looking out to the private heated pool, spa and patio. The kitchen is fully equipped and overlooks the family room with its entertainment center, audio systems and HD Smart TV. Wireless Internet runs throughout the house. A separate laundry room with new washer, dryer and utility sink adds to the home's many conveniences and leads to the large garage. There you will find bikes, tandem sit-on-the-top kayak, paddleboard and many pool and beach toys. The pool, spa and surrounding patio invite you to play or simply relax. The pool is flanked by a covered dining and grill area with built in refrigeration, perfect for cookouts and entertaining. A small pool fed by waterfalls adds to the tropical ambience. Teak lounges, chairs and benches create a setting for daytime sunbathing or evening cocktails. All you need to do is reserve this retreat and pack your bags. english, English, German, French or Italian by email. across the street from Lake Worth Lagoon and 600 paces to the Atlantic Ocean. * The house features 3 bedrooms, a large office and 3 1/2 bathrooms. * Decor is upscale and current. * The laundry room is fully equipped, with new washer and dryer. * The kitchen boasts solid wood cabinetry, granite countertops and microwave. * The master bedroom suite and office are separated from the other bedrooms for maximum privacy. The master bedroom has a king bed, walk-in closet and cozy chairs. Its ensuite bathroom has both a spacious shower and large jacuzzi tub. * The second bedroom has a queen bed, walk-in closet, flat screen television, chair and ensuite bathroom with tub and shower. * The third bedroom has two extra-long twin beds, closet, chair and ensuite bathroom with large shower. * Central heat and air conditioning, ceiling fans and plenty of screened windows and glass doors assure 24-hour comfort. * Free high-speed Internet in all rooms and digital cable television. * Heated pool and spa with teak chairs, lounges and towels. * Large patio allows grilling, covered dining and open sunbathing. * Property is pet friendly, with a fenced and secure yard. * Beach towels, toys, prepaid ocean-side lounges and umbrellas provided. We had a terrific time. Perfect house for our family. Thank you. This is a very beautiful and comfortable home. I especially liked the very high ceilings which provided an airy sense of openness. All the rooms were lovely. I found the office very attractive, quiet and useful. The pool was great. Our family rented this home for two months and we would not hesitate to rent again. It exceeded all of our expectations. A lot of effort has been put into the house to make it the most attractive and best seasonal rental on Singer Island. We have many guests who have enjoyed the house and return each year. Their enjoyment of the house makes it worth the effort. Your home was spectacular and an perfect fit for our vacation. It was decorated five star, Home and Garden. We highly recommend this location to your future guests. Without a doubt, we will return to enjoy the home and surrounding area soon. Thank you, for allowing us to enjoy your amazing home. Our goal is to give guests the perfect environment to relax and enjoy their vacation. The home has been tastefully decorated and includes many recreation options for guests to enjoy the ocean and lakes right out the front door. Our goal has been achieved when guests state they will return. Great House, Great Location, Great Time ! Thanks so much for renting us your fabulous home this week. The home was appointed with everything we needed and could have thought of and the location was perfect. The house was sooo comfortable for our family and we loved the open layout of the house and the quality of furniture and decorating that you put into the house.The one block walk to the beach was easy and the cabana passes for beach chairs everyday were a nice bonus. We also enjoyed the 2 bikes in the garage and took leisurely rides around the area everyday. The backyard and pool area were also laid out very well and we had a great time lounging by the pool and/or relaxing under the covered patio . You really set this house up as a turn key place to relax and thoroughly enjoy ourselves while on vacation. Thanks again and we would definitely want to rent your place when down in Singer Island next year. A+ time while we were there!! Rich, Diane, Robyn and Justin. Great care was taken to provide guests with the perfect environment to relax and enjoy their vacation. We are delighted when they have a great time and enjoy the amenities we provided, both within the house and with the recreational package we offer. Our family of six spent five fabulous weeks in this extremely well-appointed and spacious home. The back yard is private, and we spent many enjoyable hours outdoors either swimming in the heated pool, relaxing in the lounge chairs in sun or shaded areas, and dining in the covered patio area. All three bedrooms, each with its own bath, had very comfortable beds. The large kitchen contains all the essentials for cooking either inside or on the outdoor grill. We appreciated the beach passes to use the cabana chairs and umbrella, and we enjoyed the on-property bicycles, paddleboard, and kayak. Wi-fi enabled us to use all our electronics throughout the house and outdoor areas. The nearby property manager was very responsive to our needs. We look forward to returning for our next year’s vacation at this lovely house! It is a pleasure to know that guests have had a great time at the Pine Point home. The owners have provided everything to ensure this and they positively respond to suggestions that will make the house more comfortable for returning guests and new guests that select the home for their vacation on Singer Island. These efforts will ensure that the home is the most will-appointed and enjoyed home on the island. My friends and I found this home to be smartly decorated, very comfortable and spacious with top-notch appliances. While my friends slept in the big master bedroom suite, I slept soundly in the second bedroom. It's also very nice to enjoy a dip in the backyard pool...and then cook a steak on the outdoor Weber grill. All of this within a relaxing neighborhood, quick access to the beach, and numerous casual-dining restaurants. Overall, a 5 star experience ! I would definitely recommend this home to my friends. We have taken a lot of time preparing the house for the rental market. All the furniture in this 10 year old home is new and geared for the comfort and enjoyment of guests. Since the home is new on the rental market, it is great to hear that our first renter had a very enjoyable time. You will never have enough time to sample all of the activities in, on and alongside the waters of Singer Island. Fishing, boating, snorkeling, shopping, dining and exceptional golf are only minutes from the house. Some of South Florida's most beautiful beaches are only a Frisbee toss away. * Coral reefs can be found just off the beach. Boating, fishing, parasailing and diving can be arranged from Sailfish Marina, about 5 minutes away. * Palm Beach County's only state park lies just across the lagoon: John D. MacArthur Beach State Park, with its nature trails and gift shop. There you can picnic or observe rare wading birds and turtle nests. For added fun, bike or kayak to the park from our home. * Peanut Island can be reached by water taxi where you can tour the JF Kennedy bomb shelter or just enjoy the island. * Tropical dirinks and bar food can be found at a number of establishments on the island, as well as food stores and convenience shops. Nearby Carmine's market delivers if you prefer not to have a car. * For a spa experience, the nearby Ritz Carlton or Marriott Resort stand ready. * Across a bridge to North Palm Beach is a quaint and lively French Cafe, world class shopping at the Gardens Mall and a 16-screen cinema and fashionable stores at Downtown at the Gardens. * Further north at Juno Beach, parasailers, surfers and kite surfers dominate the beach on a breezy afterneen. Bring the dog. * A genteel setting is found across the island's other bridge, on Palm Beach. There you can tour the historical Flagler Museum, the Four Arts Museum and Gardens, Bethesda By-the Sea, or take a drive along the ocean and behold many breathtaking mansions. Stroll down Worth Avenue, or take high tea or Sunday brunch at the world-famous Breakers Hotel. * In West Palm Beach, in addition to Palm Beach International Airport (PBI--20 minutes away), the Kravis Center hosts concerts, plays, operas and many specialty events. City Place shopping center and Palm Beach Outlets are nearby, with abundant nightlife at the Gardens and on Clematis Street. * Further afield, there are horse arenas and equestrian facilities at Loxahatchee and Wellington. Steeplechase, show jumping, dressage or polo matches are on offer. * Don't forget that the area is known as the golf capital of the world. Outstanding courses include PGA National, North Palm Beach Country Club, Abacoa Golf Club and countless others that welcome guest players. * Fort Lauderdale airport (45 minutes) makes arrival from both domestic and international cities a breeze. Stays of 27 DAYS OR FEWER- $1,000 initial payment is due at booking. 50% of balance is due 90 DAYS PRIOR TO CHECK-IN 50% rest of balance is due 60 DAYS CHECK-IN Stays of 28 DAYS OR MORE- $1,500 initial payment due at booking 50% of balance due 120 days before check-in. 50% rest of balance due 90 days before check-in. The minimum stay during peak season is three weeks.